Lt. Colonel Oliver North was met by large crowds as he hit the campaign trail supporting Casey Cagle in becoming Georgia’s next Governor. Gainesville, Ga. – “There’s only one candidate who’s been endorsed. There’s only one candidate for Governor’s office who actually meets the standard of what we need and that’s Casey Cagle,” retired Lt. Colonel Oliver North enthusiastically spoke to the large crowd gathered in Gainesville, Ga. this weekend. Lt. Governor Casey Cagle has been the center of controversy for several weeks after the release of a secret recording in which Cagle speaks candidly to former gubernatorial candidate Clay Tippins about politics over policy. Regardless of this recent smear on Cagle’s bid to be Georgia’s next Governor, one fact remains and cannot be disputed, Cagle is the only candidate for governor in Ga. to receive the coveted endorsement from the National Rifle Association (NRA). 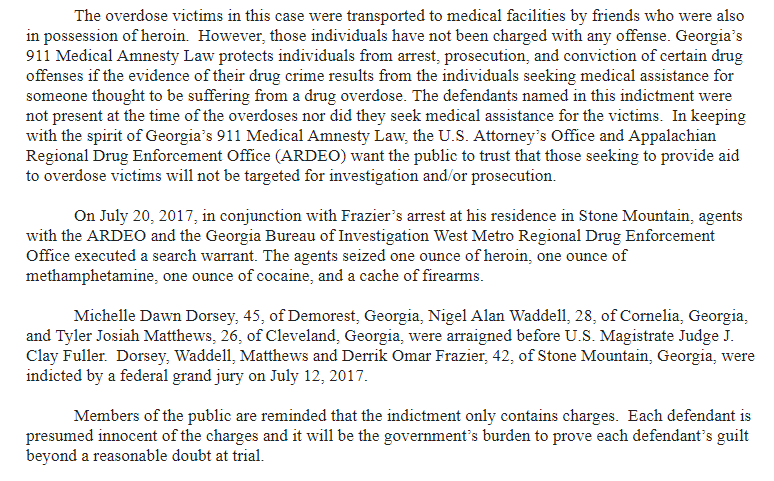 With this point being perhaps one of the largest differences between Cagle and his opponent, Brian Kemp, Cagle’s campaign decided it was time to bring out the “big guns”. 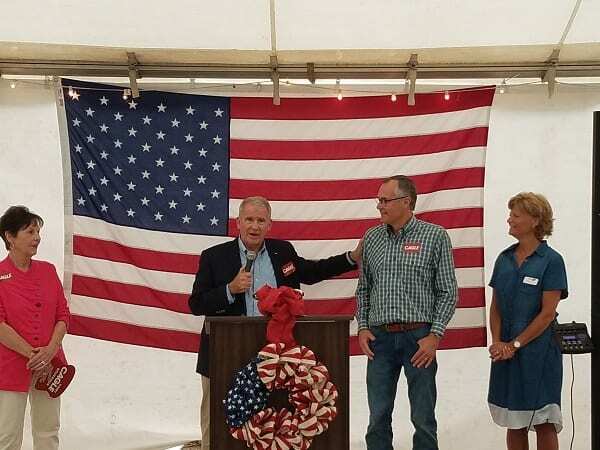 President elect of the NRA, North, hit the campaign trail with Cagle on July 14 making three stops across the state to share with constituents why Cagle is the only candidate that will uphold the values of the NRA. “I’m here because there is only one candidate for governor who has been endorsed by the National Rifle Association,” North said explaining his stance on Georgia’s heated gubernatorial race. 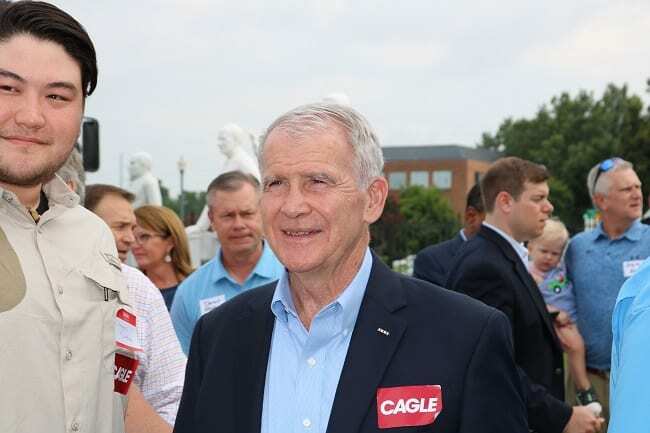 Doting on Cagle’s record of fighting for the rights of gun owners in Ga., North also brought attention to Cagle’s support of firearms manufacturing and the jobs that have created in this field. “He’s created the best, pushed through the best legislation, I think, in the country for giving you the right to defend yourselves,” North was met with cheers from the large crowd as he presented Cagle’s record on the Second Amendment. Constituents also got a peek into the private life of North as he shared personal stories of how the fight to defend the Second Amendment hits close to home threatening a long standing family tradition. Casey Cagle with wife Nita stand beside North as he addresses the crowd. This present given by North when each child turns 14 is a box containing three items, a Bible, a map and compass, and a 20 gauge shotgun. Each child is then told to read Proverbs, one Proverb per day for a month. After this task is completed and understood, North teaches the children how to use the compass and map. The final item that the child can then master is the use of the shotgun. North told of how each child must learn to take apart, put together and clean the firearm before they can tackle the task of learning to shoot. But according to North this tradition is threatened and he pointed to the fact that a couple of states have already passed laws where it is illegal for anyone under the age of 21 to possess or purchase a firearm. North concluded his endorsement with a request, “I want each one of you, if you would please, go out and find a family member and a co-worker and a neighbor and a friend. So now you’re talking four of each one that you know that’s not here today and get them to the polls on the 24th of July so that this man….”. Upon saying this North turned to Cagle and was drowned out by cheers from the audience. « Previous Article Short Takes - How Deep is the Deep State? Next Article » Johnsongrass: Friend or Foe? GAINESVILLE, Ga.—As President Trump delivers his first State of the Union address today, a northeast Georgia company is announcing its plan to deliver bonuses to its employees as a direct result of the Tax Cuts and Jobs Act. Mincey Marble was established in 1977 in Gainesville as a manufacturer of cast marble products for hospitality, healthcare and other markets around the country. Donna Mincey, President and CEO of Mincey Marble, says that the tax reform package signed into law last December will directly benefit her company’s bottom line, which allows her to further invest in Mincey’s more than 300 employees, many of whom are hourly workers. “As the owner of a family business, I want to share how tax reform is benefitting Americans at every level. Companies big and small are passing along tax savings to the workers who help build our economy. I hope that the bonuses Mincey Marble is providing encourage other businesses in our great state to pay it forward, because the Tax Cuts and Jobs Act is the kind of meaningful change that can help transform communities by bringing relief to American workers and families,” said Mincey. “Mincey Marble has been part of our community for decades, and their decision to pass along the company’s tax benefits to our hardworking neighbors is outstanding. I supported the Tax Cuts and Jobs Act with President Trump knowing it would lead to lower taxes and higher paychecks for northeast Georgians. We’re already seeing the economic benefits of tax reform happening at corporate and grass-roots levels, and I’m always thrilled to hear individual stories of how smaller government helps people—like the team members at Mincey Marble—invest in bigger dreams,” said Collins. Employees at Mincey Marble will receive bonuses of up to $1,000 depending on their length of service with the company. Even employees hired this year will see a bonus, and the checks are scheduled to arrive during the week of Valentine’s Day as a sign of the company’s appreciation for its associates. Due in large part to their confidence in the Trump Administration’s pro-business agenda, Mincey Marble’s management team also made the decision in January 2017 to expand the size and operations of a new facility that is currently under construction in Gainesville. Other Georgia companies that have increased employee benefits in the days since President Trump signed the Tax Cuts and Jobs Act into law include Aflac, Home Depot and Yancey Bros. Caterpillar Dealer. GAINESVILLE, Ga.—Two students from northeast Georgia have been offered admission to a U.S. military academy. Cameron Sturdivant will join the class of 2022 at the U.S. Air Force Academy, and Chase Nufer will attend the U.S. Naval Academy. Rep. Doug Collins (R-Ga.) nominated these students to the military academies because of their integrity and track record of accomplishment in the community. “I couldn’t be prouder of Cameron and Chase, who have dedicated themselves to servant leadership roles early in life. I look forward to their success in Colorado Springs and Annapolis as they reflect the strong character of northeast Georgia,” said Collins. Sturdivant is the son of Ms. Chere Rucker. He attends Gainesville High School and is following in the footsteps of his brother, Mr. Donovan Moss, who is currently a senior at the Air Force Academy. Nufer, son of Mr. Peter & Ms. Heidi Nufer, is the captain of the baseball team at Forsyth Central High School and a member of the National Honor Society. Next Article » What's Still Dividing America? GAINESVILLE, Ga.—Rep. Doug Collins (R-Ga.) is holding a town hall meeting in Gainesville this Wednesday. 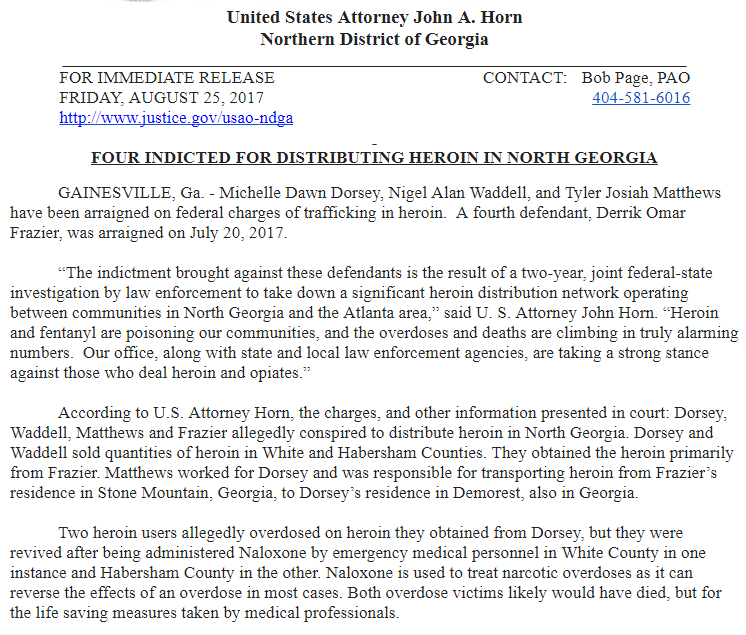 “Washington needs to hear the voice of northeast Georgia, and I’m looking forward to continuing conversations with neighbors this week. “Whether I’m working for rural broadband access, fighting for criminal justice reform or advocating for local residents in the face of federal bureaucracy, I’m grateful for the opportunity to represent the values and priorities of our community, and that starts with listening to its residents,” said Collins. Collins will also update residents on the progress being made by the unified government led by President Trump. Since January, the American economy has added more than one million new jobs. Congress and the White House have eliminated billions of dollars in regulatory burdens and are working together on comprehensive tax reform. All Ninth District residents are welcome, and details are below. Security: For the security of all in attendance, please be advised that no bags or signs will be permitted. Background: Collins has held public meetings over the August district work period every year that he has served as the U.S. Representative for the Ninth District of Georgia. In addition to holding public meetings over this period, Collins welcomes residents to join him for interactive telephone town hall conversations regularly while Congress is in session. Thousands of residents from across the twenty counties of northeast Georgia participate in these interactive events, and Collins has held six telephone town halls this year. To learn more about these live conversations or sign up to participate in a future event, residents may visit his site. “I’m grateful for the opportunity to represent the values and priorities of our community, and that starts with listening to its residents.”GAINESVILLE, Ga.—Rep. 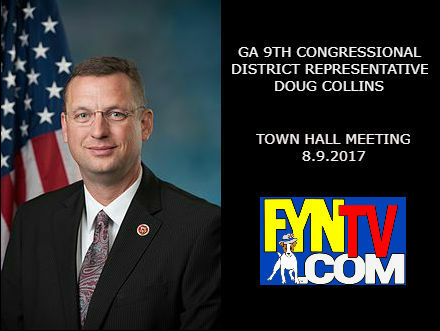 Doug Collins (R-Ga.) is holding a town hall meeting in Gainesville this Wednesday.